Display Developments have recently supplied a new outdoor menu display case to the Holiday Inn Hotel at Armacao de Pera on the beautiful Algarve coast of Portugal. 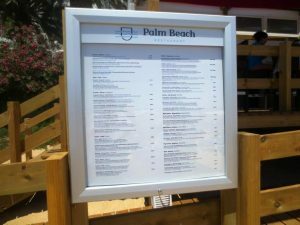 The requirement was for an external menu case to display the menu at their new beachside restaurant called the Palm Beach. The brief specified a robust, LED illuminated menu case capable of withstanding the sometimes harsh Atlantic weather and of course the hot sun. Display Developments had the perfect solution and recommended a case from their impressive Trim T range. The case was duly ordered and is now taking pride of place and has resulted in an increased flow of customers visiting the restaurant. The Operations Manager is delighted with the menu case and said “It is a perfect fit for our menu and the LED lighting means it looks great at night too”. Display Developments Build New Display Case For The Old Royal Naval College, Greenwich. Don’t miss future posts!! Sign up to receive updates.